Oh my goodness! After suffering all week with this virus and the horrible vertigo that came with it, I want to do absolutely NOTHING today. Which is usual for me, since I'm a busy body. I'm exhausted and I can't wait to feel like myself again. I had big plans for blogging today, but the thought of taking pictures, uploading, adjusting, watermarking, etc... makes me tired! So, here's an older card that I haven't shared yet. It's super clean and FAST! The sticker and patterned paper are from Reminisce. The rhinestones are from Studio 18. 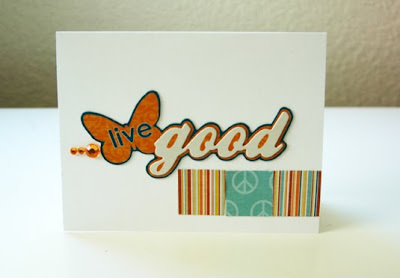 I think this is perfect for the Clean and Graphic challenge over at Moxie Fab World. Thanks for stopping by again. If I can find some energy, I'll have more blog posts later. :) Happy Sunday, friends! Super cute and clean card! I hope you feel like your old self again soon! I can only imagine how exhausted you are! Chill and relax! This is so adorable! Love how clean it is! Hope you feel better soon! glad you are on the mend, Ashley!